In a large bowl, cream the butter, brown sugar and espresso until blended. Combine flour and cinnamon; gradually add to creamed mixture and mix well. Bake at 350° for 18-22 minutes or until lightly browned. 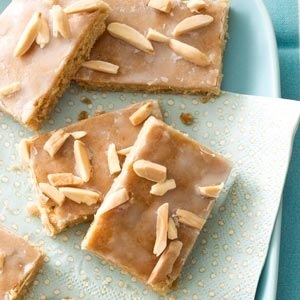 In a small bowl, combine the confectioners’ sugar, water and extract until smooth; spread over warm bars.